2018 has kicked off on a high at Victor Mee Auctions with an incredibly well-received 4th February Fine Arts and Decorate Antique Interiors sale at Victor Mee Auctions. Among the over 750 lots included in this auction were some truly outstanding Victorian-era taxidermy pieces which received attention from bidders around the world. The highlight of the sale was a taxidermy case including a bird display which went for an impressive €8,000 to a private collector in America who bid over the phone. The team are delighted by this hammer price – what we believe may be the highest for a taxidermy piece sold in Ireland to date. 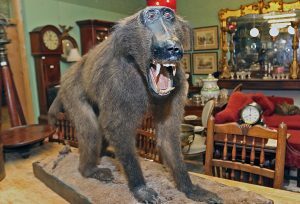 A 19th century baboon also went for €1,000 and mounted zebra sold for €1,600 to separate private collectors. Reflecting on the success of Sunday’s Fine Arts and Decorative Antique Interiors Sale, auctioneer Victor Mee said, “Rare items with good provinence will always command high sale prices. 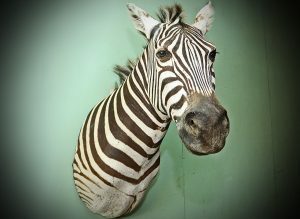 In the case of this unique display of taxidermy, the high quality of the piece combined with its regal lineage created significant interest among our global clientele. 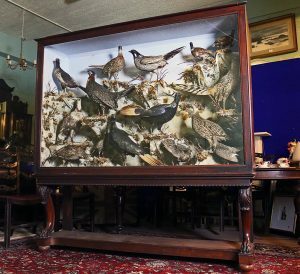 “The 19th century taxidermy pheasants, ‘The Pheasants of the World’ by John Leadbeater, the leading 19th century taxidermist, holder of the Royal Warrant of Queen Victoria, chief taxidermist at the Museum of Victoria in Australia, and ornithologist to Queen Victoria, came out of the 8th Marquis of Waterford, Curraghmore House, thirty years ago. A polo teammate of the Duke of Edinburgh, the Marquis – along with his ancestors – was a noted hunter, and it is of note that his predecessor was indeed mauled by a lion!